Do you have a sports fan in your house? Is your dad or father-in-law a die hard sports fanatic? Do you struggle to find them the perfect gift, a gift that they don't already have? If you answered yes to one or more of these questions then you're going to love Three60 Gear! My husband and 10 year old son are huge sports fans. Hockey is their favorite sport of all time, they are almost to the point of being obsessed. Our son is a huge Steelers and Red Wings fan, dedicated and loyal no matter what others say. He also has a huge sports collection that includes figurines, trading cards, baseball bats, posters and more that cover his room from top to bottom. I recently found Three60 Gear photo shirts. Many of which come in both youth and adult sizes. What a great gift idea for that sports fan in your life. They are original, unique and functional making them the perfect gift. 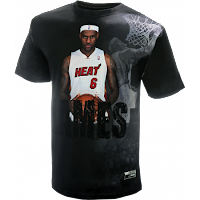 For my review, I was able to get a shirt with my son's favorite baseball player of all time, Lebron James! You should have seen the look on his face when he opened the package and saw what was inside. I only wish I had been able to capture it on film. It was priceless! My son immediately took off the shirt he was wearing and put his new Three60 Gear shirt on. He said he was never going to take it off, not even to get it washed. The smile on his face in this photo tells you exactly how thrilled and excited he was about his new shirt. Honestly, it took me 3 days to finally get him to take it off so I could wash it. Daddy even threatened to steal it from him but he was convinced it would never happen because it was too small for Dad to wear. The photos are simply amazing. So clear and detailed it's almost like you are viewing the action in person. Each Three60 Gear photo shirt includes a patch with its own serial number that details the date and location of each photo. The fabric is soft, comfortable and durable. It is also "cool" to the touch and helps keep you cool on hot days and during physical activity. It's similar to swimwear and under armour. They dry quickly and help control odor too! Very important for young, active boys and men as well. I appreciate it too since I'm the one doing the laundry. It washes wonderfully too. Now that my husband has seen our son's Three60 Gear shirt he wants one for himself. There's only on slight problem... he can't decide which one he wants. Three60 Gear offers a wide variety of sports shirts for MLB, NBA, and very soon they will have NHL. My son and husband can hardly wait for the NHL release! Need a Three60 Gear T-Shirt right now? You can save 25% off your entire order AND get FREE shipping! Simply use coupon code ALLSTAR2011 as checkout! Valid through 7/12! Vivid photo-real sports apparel: The Three60 Gear line captures the excitement of sports with all-star athletes in motion! One of a kind, high definition sports apparel. Our MLB-licensed photo shirts are unique! Three60 Gear has created a jersey with an innovative design which makes each one distinct, eye catching, and exciting. Featuring all-star athletes in motion, each jersey is handcrafted and uses high-quality action images from key games to create a vibrant piece that is a collector’s item. Creases and folds in each piece are indicative of the craftsmanship and handiwork that goes into each jersey, with a different 360 degree image on the front and back. A comprehensive design of the player, the field, and the fans, sporting the jersey is a unique way of supporting your favorite all-star. Your one-of-a-kind Three60 Gear original photo t-shirt has been created by hand using vivid action photos. The performance fabric includes wicking, anti-microbial properties, and is dye sublimated resulting in white areas near seams, creases or folds. These are marks of the authentic handcrafted process. Visit Three60 Gear and tell me which shirt you would want! A special thanks to Three60 Gear for this great review and giveaway opportunity! I would love the Buster Posey shirt for my Hubby! I would love the Detroit Tigers Justin Verlander T-shirt. I follow Three60 Gear on Twitter as svberges. I would love to have the Jeter 3000 Hit T-Shirt for my husband. I am following via GFC as Jill Myrick #2.